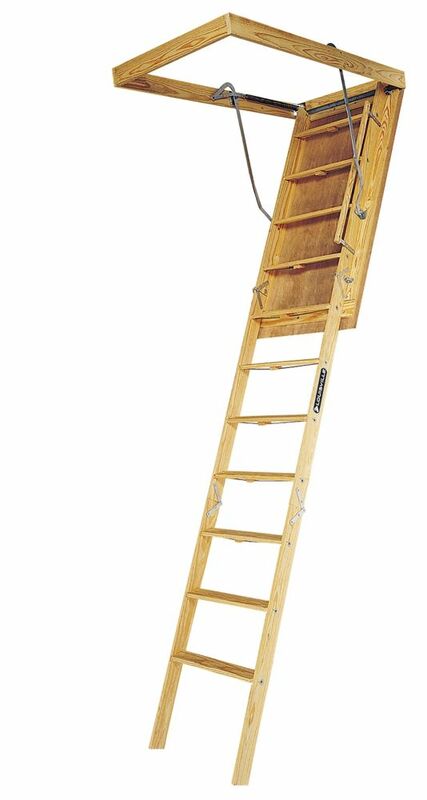 This Louisville Big Boy Series wood attic ladder has a working load capability of 350lbs. This wood attic ladder fits ceiling heights of 7' to 8' 9" and has a rough opening of 30" X 60". The Big Boy S305P features extra-deep 5-1/4" reinforced steps, adjustable spring, an ergonomic T-handle, and easy-hang straps. Big Boy Series 7 Feet - 8 Feet 9 Inch, 30 Inch x 60 Inch Wood Attic Ladder with 350 lbs. Maximum Load Capacity This Louisville Big Boy Series wood attic ladder has a working load capability of 350lbs. This wood attic ladder fits ceiling heights of 7' to 8' 9" and has a rough opening of 30" X 60". The Big Boy S305P features extra-deep 5-1/4" reinforced steps, adjustable spring, an ergonomic T-handle, and easy-hang straps. Big Boy Series 7 Feet - 8 Feet 9 Inch, 30 Inch x 60 Inch Wood Attic Ladder with 350 lbs. Maximum Load Capacity is rated 1.0 out of 5 by 1. The product title implies the ladder would work for ceiling heights between 7 ft and 8 ft 9 in. The specifications indicate a maximum ceiling height of 8 feet. My ceiling height is 8 ft-3 in. Will this work?